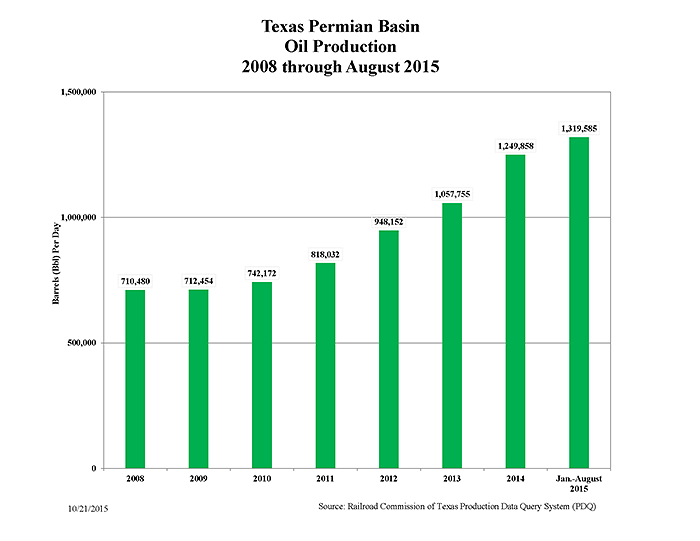 The Permian Basin in west Texas and eastern New Mexico is one of the last areas in which horizontal drilling began. It has already produced oil for decades. Even during the lowest prices, many vertical Permian wells remained profitable. Because of its vast depositional sea, stacked pay, pipeline infrastructure, and critical mass of talent and organizations, the Permian Basin remains one of the lowest-cost areas in the US in which to drill for oil. As a consequence, the operational and financial momentum developed by the boom in unconventional drilling now focuses on the Permian as rig counts and development decline in other, less-prolific and less oil-prone US plays. An interesting and unusual Permian entity continues to be the University of Texas University Lands Office (ULO). Texas University Lands' history dates back to 1838 and its first oil discovery occurred in 1923. Revenues from the University Lands go to the Permanent University Fund (PUF), with one-third allocated to the Texas A&M system and two-thirds to the University of Texas system. In addition to oil leasing, University Lands' surface activities include pipeline and power line easements, grazing, ranching, hunting, wind farms, a winery, airports, public schools, and water sales. The entire PUF had a market value of $17.4 billion as of August 2014 and annual revenues from University Lands to the PUF reached over a billion dollars in 2014. The ULO's new chief, Mark Houser, has oil company experience. He is hiring technical staff so the office can take a better-informed role in assessing its 2.1 million acres, including its 9000 active wells and 220,000 barrels of oil equivalent per day (BOE/D) of oil and gas production. ULO will continue to leave actual operations to over two hundred for-profit partner companies like Devon, Pioneer, and Apache. Two points of particular note: horizontal drilling in the Permian developed first on University Lands because it has so much contiguous acreage. When companies are drilling 5000- to 8000-foot laterals, dealing with one owner for a few miles in each direction makes leasing faster and easier. Second is that 1.5 million of the 2.1 million acres, or 71%, of University Lands are leased for drilling. In January 2016, the ULO expects to do a targeted lease sale of some of its Midland-area land, with a larger bid round occurring during the third quarter of 2016. I, Laura Starks, do hereby certify that, to the best of my knowledge, the views and opinions in this research report accurately reflect my personal views about the companies and their securities as of the date of this report. These viewpoints and opinions may be subject to change without notice and Starks Energy Economics, LLC will not be responsible for any consequences associated with reliance on any statement or opinion contained in this communication. Members of Starks Energy Economics, LLC own securities of Approach Resources, Diamondback Energy, and Parsley Energy.